I am raising money on behalf of my mom, Jamie Rawding. 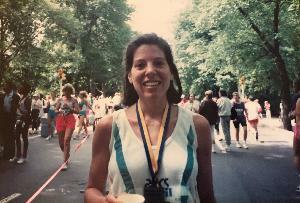 My mom, pictured on this page, finished her first marathon in New York City at age 24. I am training to run my first marathon this fall in New York City, also at the age of 24. I'm running and raising money with Fred's Team to support critical cancer research at Memorial Sloan Kettering Cancer Center (MSK). Research is a key part of my mom's treatment plan for non-hodgkins lymphoma. By donating to my race, you will be giving doctors and researchers at MSK the funding they need to make groundbreaking discoveries and conduct lifesaving clinical trials.